I'm Running to Eat! : Carb Loading! It's been a surprising week on the running front. I'm finally pretty much recovered, I think. I've gotten 10 miles in so far this week and despite the two weeks I had to take off, they felt good. I could have pushed it more but I was afraid to overdo it. This is about the same time last year that I tried to make up a few missed workouts and ended up pulling my hamstring and missing out on a whole summer of racing. Tomorrow is the 9-mile group run. I'm not sure I'm ready for 9 miles though. I ran 6 right before I got sick so I think dh and I are going to try to walk/run 6 instead. I figured it was about time to start practicing the whole "carb-loading" thing so I pulled out an old favorite. 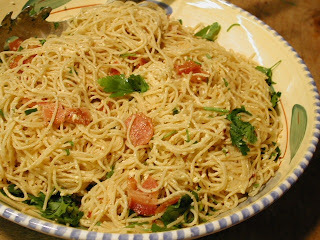 ;-) This is Rachael Ray's Spaghetti Carbonara: Pasta with Bacon and Egg from her 30-Minute Meals cookbook. Luckily, earlier this week while I was scouring Jill's Simple Daily Recipes for some more yummy recipes like this one, I came across her blog about a great way to fix bacon in the oven. Now I love the taste of bacon, especially when it's nice and crispy. One of my favorite meals is a BLT sandwich with summer fresh tomatoes from the garden. Yum! But being someone meat-phobic, cooking up the raw bacon sort of ooks me out. Not to mention all the painful clean up and that I never seem to be able to get the bacon to come out just right, I couldn't wait to try cooking bacon in the oven. Tonight was the perfect time to try it out. Prep was easy. Simply line a cookie sheet with foil, place bacon on the foil and place in a cold oven. Bake 20 minutes at 400 degrees F and the bacon comes out perfect. Even better, remove the foil and clean up is done! Ray's Pasta with Bacon and Egg has been a family favorite for quite awhile now. It's quick and tasty and a very forgiving recipe. I've made it with pancetta as well as with pre-cooked microwave bacon and it comes out fine every time. I prefer freshly grated Parmesan as opposed to the stuff in the green can, but either will work. Freshly ground pepper is a must and fresh parsley is best but dried parsley will work in a pinch. Heat garlic and olive oil in a big skillet over very low heat. Add crushed red pepper flakes if you like extra heat. Dump the pasta into a colander, give it a quick rinse and drain it well. Turn the heat up on the garlic oil from low to medium. Toss the pasta in the pan with the garlic oil and coat the pasta evenly. Toss in the bacon pieces. Pour the egg mixture evenly over the pasta. Toss the pasta fast and firmly. Turn the heat off. Add cheese, parsley and a generous dose of black pepper. Serve it up hot, with extra cheese and pepper. I watched Ina, the barefoot contessa, bake pancetta in the oven just like we baked the bacon. She was using it for a Chicken Caesar salad sandwich. If you're interested, you can find her recipes off Food Network's recipe page.